Welcome back to Future. Thanks for subscribing. Consider inviting your friends and colleagues to sign up. The city said the money will go, among other things, to build about 600 affordable housing units and fund rental subsidies on 300 units. Google did not respond to an email asking the same question. You can read Amazon and Facebook's responses in our full post in the Axios stream. We know that major U.S. cities such as New York and Boston are pricing swaths of people out of the housing market. But the cities are also unfavorable ground if you happen to be seeking work in certain lower-paid occupations, like as a trailer mechanic, concrete finisher or freight handler, according to a new report. Why it matters: The report by the jobs listing site Indeed suggests that big U.S. cities are increasingly bland places — havens for richly-paid data scientists and behavioral therapists who may never mix with a lawn technician or a cable installer. How to read the chart above: You are looking at the number of wanted ads in expensive U.S. cities, sorted by occupation. The percentages compare job listings in pricey and other, not-so-pricey metro areas. 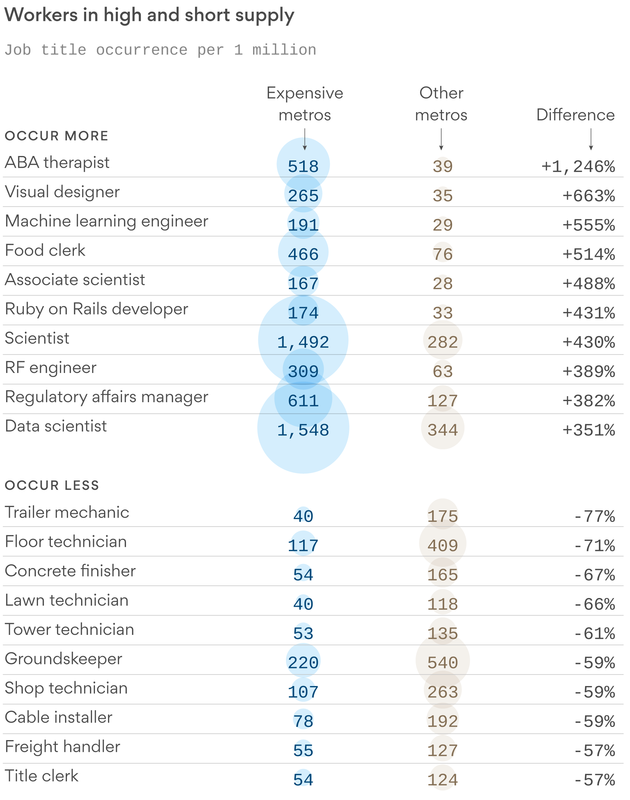 The top grouping are plentiful jobs, and the bottom are listed far less often in wanted ads. Less-diverse cities tend to grow slower, he said: If a certain occupation gets wiped out by market conditions, diversity is a "form of insurance," maintaining economic conditions including the tax base. But some of the lack of certain jobs lies in the nature of cities: "There are fewer auto mechanics and groundskeepers because fewer people own cars and have lawns," Kolko said. A side effect of the e-commerce boom is a shortage of truck drivers and an overwhelmed shipping industry. 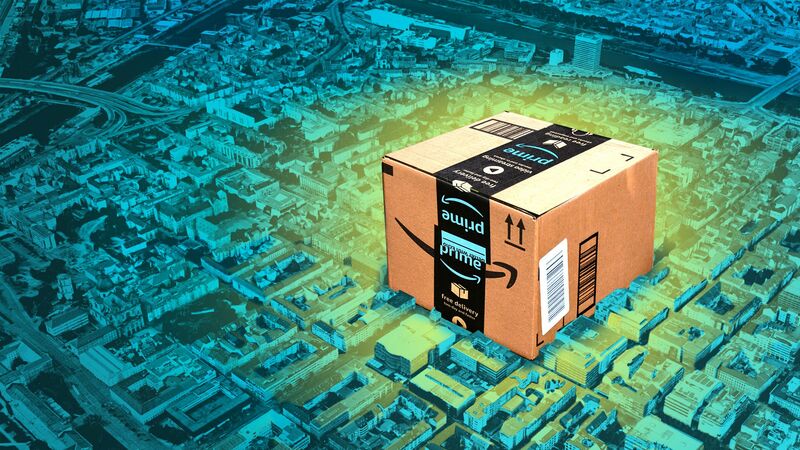 As one solution, carriers including Amazon and FedEx have been — unsuccessfully so far — lobbying Congress to allow nationwide use of longer trailers, hooked one behind the other. Why it matters: Around the world, people are ordering increasing volumes of stuff online, which is putting growing stress on shippers. Longer trucks, according to the shippers, are one solution to getting packages delivered more quickly. What's going on: This week, truck shippers are pushing the legislation again, asking a House committee to allow rigs to pull back-to-back, 33-foot-long trailers. That would make them five feet longer than the current federal maximum, allowing for 18% more freight in each trip. Opponents of the legislation say smaller carriers would be hurt because they'd have to buy a new fleet, while losing their current, now-obsolescent trucks. And drivers lacking skill and licensing on the new rigs, they say, could be thrown out of work. But shippers say the change would impact only package shippers — not heavier and bigger, long-range trucks. They also say truckers would not need new licenses to pull the 33-foot trailers. They also say cargo demand is soaring: In 2045, U.S. cargo trucks will move 16.5 billion tons of cargo, a 43% surge from 11.5 billion tons in 2015, according to the U.S. Bureau of Transportation Statistics. Another issue: Matt Manda, from Firehouse Strategies, a strategic communications firm hired by FedEx, tells Axios that the truck driver shortage is getting worse: the average age of truck drivers is 49, seven years older than the average of all U.S. workers. At Quanta, Kevin Hartnett speaks with Judea Pearl about The Book of Why, out last week, in which the AI pioneer challenges an intoxication with machine learning and proposes something new. In MIT Tech Review, Erik Brynjolfsson talks with Nobel laureate Daniel Kahneman about his forthcoming Noise (no publishing date has been announced). Good decisions are made more difficult because, among other things, experts differ so much on the "right" answer — an example of "noise," a malady from which machines, Kahneman writes, do not suffer. In TIME, an excerpt from Steven Brill's Tailspin, out May 29. Brill writes that, inadvertently, the seeds were created throughout the 20th century for the destruction of the American dream. In Harpers, Seymour Hersh excerpts Reporter, his memoir, out June 5. One of our time's preeminent investigative reporters tells the personal story behind his scoops, including his discovery of the My Lai massacre. Astronauts have grown cabbage and tomatoes in space. They have watched flowers bloom. Now, in a launch tomorrow morning, NASA is sending up mutant seeds to help make such plants more nutritious, easily digestible, and recyclable for oxygen and carbon — as they will have to be if we are to support long-term human colonies, writes Axios' Alison Snyder. What's going on: A seed experiment — going to the International Space Station at 4:39 a.m. EDT (watch the liftoff live here) — will help determine how much a key molecule that allows plants to grow upright against Earth's gravity can be tailored in space. Why it matters: It's another step in allowing long-term space living and the colonization of other planets. The objectives: The issue is lignin. Researchers are sending up strains of Arabidopsis thaliana, the fruit fly of plant research, which produces different amounts of lignin. Like bones in humans, lignin supports plants and delivers water and nutrients throughout their tissues. Lignin also sequesters carbon and is a form of dietary fiber we consume but can't digest. They are trying to determine how much lignin a plant needs in space. The bottom line, from Washington State University's Norman Lewis, who leads the experiment: "Ask any astronaut, and they will tell you, 'When you see something living in this extreme environment, it is a reminder of home.'"